Edo Castro is one of the Bay Area's most prolific bassists and composers. His previous albums, "Edo" and the critically acclaimed "Phoenix" both on the Passion Star label, saw Castro's love of jazz, textures and his Matheny-like passion for perfection reach new heights. Now comes Castro's most ambitious work to date, "Sacred Graffiti". 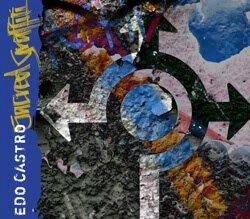 Castro brings together the members of his "Expandable Trio", guitarist Erik Lindquist and drummer Alex Aspinall, as well as stellar musicians like trumpeter Mark Isham and virtuoso bassist Michael Manring to produce a sonic soundscape that will treat the listener to the breadth and depth of his musical prowess. Castro is a master of the 7 string bass, looping, and like the legendary Manring, adept with the use of a device called the "Ebow". The Ebow allows a guitarist or bassist to electronically vibrate their strings, producing some of the most beautiful textures you are ever likely to hear. Add Castro's use of a Roland guitar/bass synthesizer and you are in a new aural territory. Some of the best examples of this technique on the album, are the gorgeous and moody "Drifting Across the Night Sky" and the sinewy "When the Stars Fell On You". Castro hasn't forgotten his jazz roots. "The Gathering", featuring saxophonist Dan Zinn, harkens back to the flavor of his earlier albums and "Bent Blues" features Castro's Expandable Trio group in top form, alongside keyboardist Greg Sankovich. The Matheny-esque guitar work of Lindquist on "Left of Center" is another fine outing by the quartet, with nice brushwork by Aspinall on drums. Castro also assembled some of the finest musicians around to augment this recording; Michael Manring on "57th Latitude", Percy Jones on "Evidence", David Friesen on "A Travel Lodge Moment", trumpeter Mark Isham's beautiful turn on the title cut, "Sacred Graffiti", and many others, including local percussionist extraordinaire Jonathan Moe. I might add that Castro has added some "graffiti" in some interesting spots on the album; phone messages, phonograph crackles, thunder, lightning and more. I nearly pulled over while listening to the title cut in my car, when the sound of sirens suddenly crept up. I may have been driving too fast while listening to Isham's trumpet solo! All's well that ends well however, as Castro's beautiful coda, "A Thread of Blue (Fine)", closes the album. There is something for everyone on this album, new age textures and ambient passages, to thoughtful and uncompromising jazz compositions. Fans of Castro may have wished for an album of all textures, or all original jazz. They may indeed be forthcoming. One thing is clear, there are many, many great ideas in the mind of Edo Castro waiting to come out. In the meantime, we will be content with the canvas of textures he has painted with "Sacred Graffiti". Castro will have his CD release show Sunday, November 14th from 6-9:30 at Studio 333 in Sausalito. Joining him will be members of the Expandable Trio, as well as saxophonist Dan Zinn and keyboardist Greg Sankovich. Also joining Castro are two other musicians on the album, Chris Stafford and Richard Gee. Opening will be the Michael LaMacchia Trio.